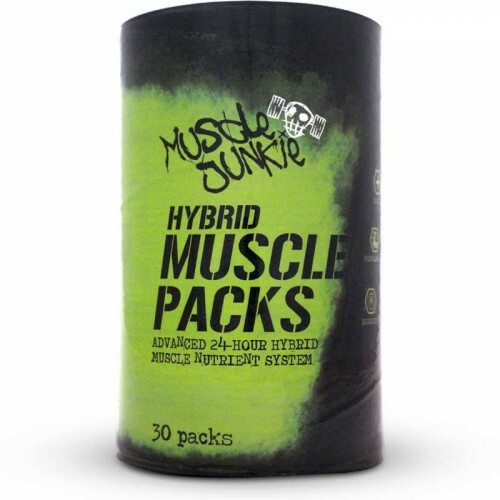 Muscle Junkie Hybrid Muscle Packs is an advanced vitamin and mineral system designed to keep athletes performing at their peak. Athletes and Lifters need more vitamins and minerals due to the intense training they do. That means eating more micronutrient dense food in addition to the food they need to grow muscle. Challenges of modern lifestyles and availability of quality food make supplementing with a complete multivitamin a viable option for athletes. Included in each pack are EFAs which are healthy fats responsible for nervous system development and hormone production. Studies have shown EFAs to have a positive effect on brain development and cognitive health. Our brains are comprised of approximately 70% of these healthy fats! Formulated with a full spectrum of water and fat soluble vitamins which ensures optimal nutrient saturation. Key ingredients have been included to offer bone and joint protection from the stresses of weight training. Each tin contains 30 individual packs, each loaded with vitamins and minerals to keep athletes at their peak month after month. The demands of intense training and not getting enough vitamin rich food may create nutritional deficiencies. Muscle Junkie Hybrid Muscle Packs is an insurance to support years of an active fitness lifestyle. Other Ingredients: Gelatin, Microcrystalline Cellulose (Bulking Agents), Magnesium Stearate (Free-Flowing Agent), Silica. This product is manufactured in a facility that uses soy, dairy, crustaceans, egg and wheat (gluten). • One serving is 1 Sachet. • Take a serving with your morning shake or breakfast meal.